This amazing image was chosen to be on the cover of the 2014 Spectacular Bride Magazine. Spectacular Bride is known for it’s inspiration and for featuring the work of Las Vegas wedding photographers. After the bridal fashion shoot the magazine ended up with hundreds of images from local photographers. Their graphics team was looking for the image that have a special quality that will reach out and attract the eyes of prospective brides to be. "Edina Dibusz, of Images by EDI has a style that sets itself apart. 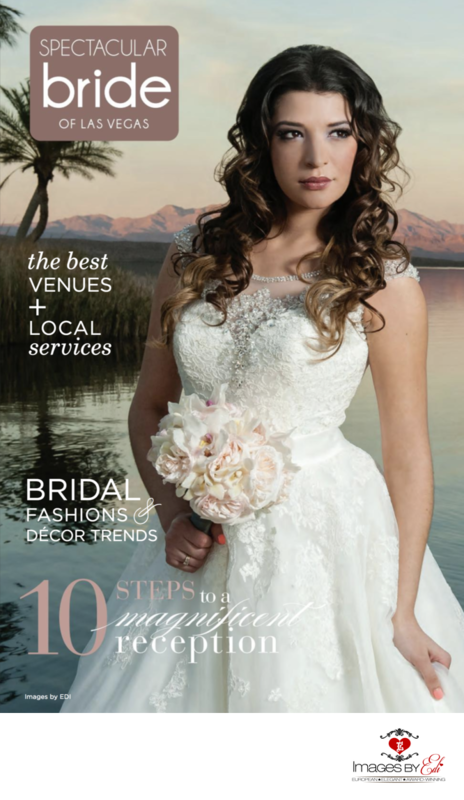 If you have picked up a copy of our recent Spectacular Bride issue you have seen the image that won the honored placement for the January 2014 issue." The image was taken on location at The Westin Lake Las Vegas Resort. Model Jaffet Soder is wearing a gown from Bowties Bridal and her hair and make up were done by Hair’z by Melinda.